pport legalization. According to Pew’s official press release, it’s noted that “Support for legalizing marijuana has risen 11 points since 2010.” 52% are said to be in support of legalization, which just 45% in opposition. On top of this support, there’s even further support for having the feds back off of their war on marijuana. 72% believe that the federal government’s enforcement of marijuana laws costs more than it’s worth, and 60% believe that they should leave states that legalize marijuana alone entirely. Among those who stated they’ve used marijuana in the past year, 47% say they used it “just for fun,” 30% say it was for a medical issue, and 23% say they used it for both medicine and recreation. 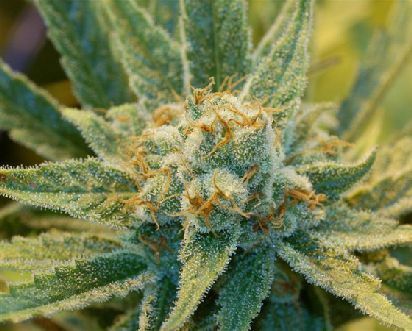 The research found that an overwhelming majority in the U.S., 77% to 16%, believe marijuana has legitimate medical use. Less than two decades ago, those numbers were 58% to 34%. 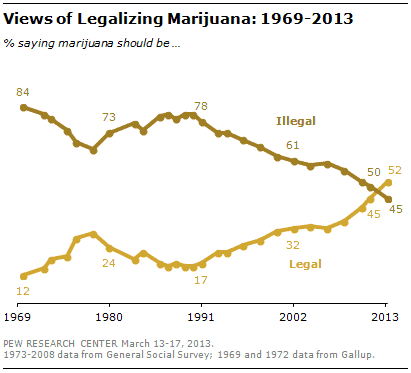 Marijuana legalization shared its highest support among those aged 18-32, with 65%. This is a drastic increase from 2008, where it was found that 36% in this age group supported legal marijuana. This new polling makes it clear that marijuana legalization is far more mainstream than it’s ever been. It’s inevitable. You can find the polling in its entirety here.